This is one area that I would come by late at night as there is always the promise of a selection of good food – chicken rice, ba kut teh (pork rib soup), tradjtional Chinese desserts, noodles and frog porridge. This is a stall that is a branch of the famous frog porridge in Geylang Lorong 11. Though it does not have the oomph that the one in Geylang is renown for, it still makes for a great supper spot for evenings you are too tired to deal with the traffic in Geylang. 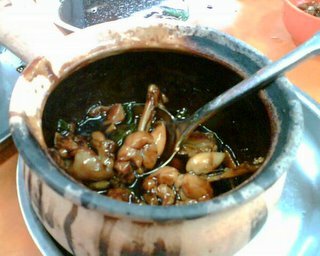 The claypot frog is usually cooked with plenty of dried chillies (though you can also opt for a non-spicy version) – so that it is altogether sweet, a tad salty and spicy. Use the thick sauce to lace the plain porridge that comes with it, and it makes for a gorgeous meal late at night. And fear not, the frogs actually taste plenty good, like very tender chicken. 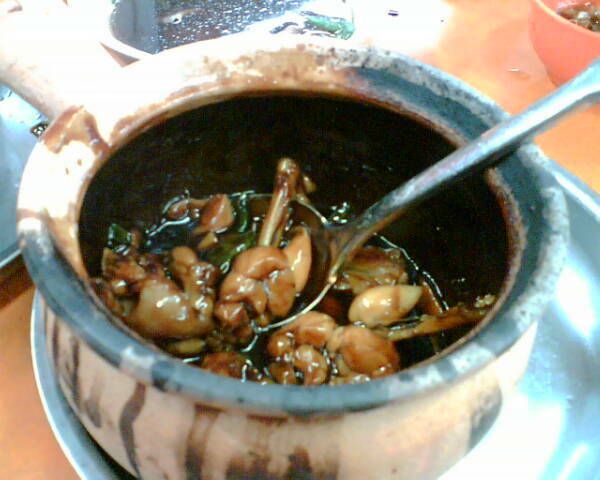 Prices are manageable, we spent S$30 (US$18) on 2 claypot frogs accompanied with a claypot porridge.